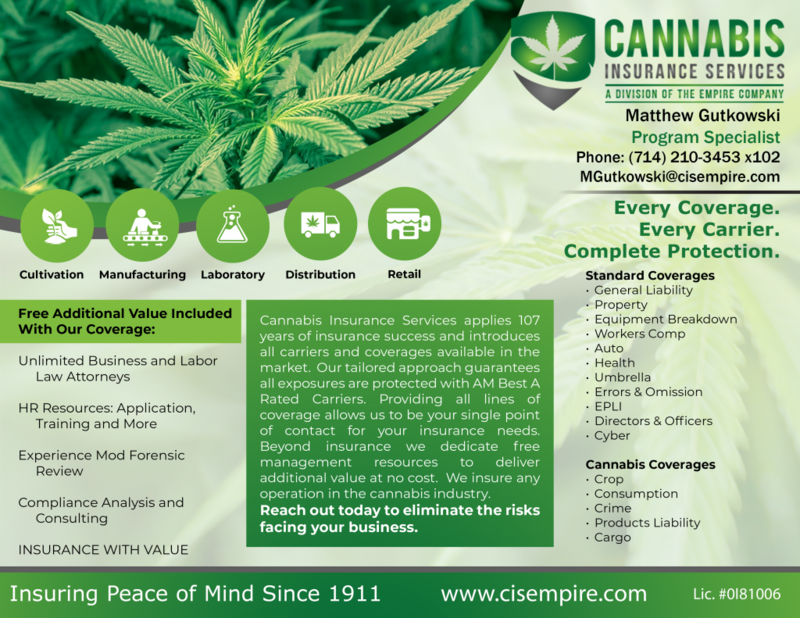 Cannabis Insurance Services offers all insurance lines necessary to protect your business from seed to sale. Our mission is provide all insurance policies required to protect your business from any loss. This portfolio of products assures that any risk facing your business has a policy specific to that exposure. We have common, standard policies available, alongside cannabis tailored coverage to indemnify all potential losses. Our carrier network includes both standard providers and marijuana focused markets to present all policies available in the industry. Each business faces specific risks. Our Exposure Analysis guarantees any potential loss will be indemnified. This analysis entails an overview of your company and the various operations performed. Following our review we determine the exact limits and policies for complete protection. Cultivation encompasses numerous exposures from utilized equipment to the essential grow. See what policies we recommend for your growing business. Extraction and edible production requires capital investment and subrogates the liability to the manufacturing company. Lab Testing and Product Analysis Services are liable for negative outcome of varified products. Equipment, inventory and emplyees post additional exposures at risk. Transporting cannabis goods posses the greatest opportunity to crime. It is vital to insure the product during transit. Submit your information now to have our Program Specialist contact you today to begin the quoting process. CIS specializes in the cannabis industry and insures all companies in this field across the nation. Our clients enjoy the peace of mind knowing their policy is tailored to their marijuana business at the market’s lowest rates. © 2019 Cannabis Insurance Services. All Rights Reserved.